Fear. Fear is all around us. Fear can drive a lot of what we do (or not do) in life. Typically we avoid those things that cause us fear, but every now and then we press into our fears and try to overcome them. 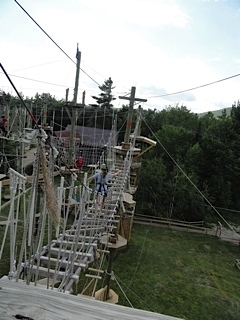 Earlier this summer we decided to press into some of that fear together with our older girls by taking them to a ropes course. The day started with learning to put on the harness and various safety tips. After a short climb through the practice course, we were on our way. The course is designed in a way that each challenge builds in difficulty as you progress up the levels to the top. 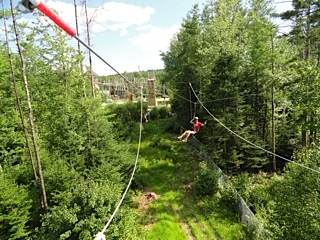 At the top you are rewarded with long zip-lines that travel into the tree canopy. The challenges can build self-confidence once achieved, but can create fear as they become more and more difficult and are higher and higher in the air. One daughter was able to embrace the fear and move from challenge to challenge. Any observer would be able to tell she was afraid, but she kept her narrator in check with a long string of positive self-talk. Our other daughter wrestled with the fear. After a few levels, the intensity became overwhelming and her narrator started to creep in with self-doubt. We subscribe to the “Challenge by Choice” approach, which means that there is no pressure to continue and each person can make the choice to continue or not. We do encourage each other to stretch and challenge ourselves but do not apply pressure or guilt if someone needs to stop. We regrouped a little and talked things out. As we talked we discovered that she really wanted to do was to go down the large zip line and was disappointed that there was no way to get there except through the challenges. Everyone in our group spoke encouragement and life into her. They reminded her how much she had accomplished already and we would all work together to get her to that zip line, if she wanted to. Our little tribe began to work together and communicate in a way that had not happened earlier that day. Everyone was listening, helping to plan, and deciding who would travel to which challenge to either demonstrate how to accomplish it, or be available to help. Amazing words of encouragement traveled between all of us. When we reached the top tower, there were just a few challenges left to reach the zip line. The first was a rope and wooden bridge that we dubbed the “pirate bridge.” It was at this challenge that our daughter shifted. Confidence had replaced most of the earlier fear and the journey was almost over. She stood at the edge of the tower and clipped her harness to the guide wire first. Isn’t that the way life should be? By facing our fears together we can help each other combat that narrator that tries to tell us that we cannot succeed and perhaps fear can play a smaller role in our lives.